At the end of 2009 we launched a fun app to let you the people define and share what color you saw representing 2010. Well this year isn't over and we still want you to name the color you feel best embodies this year... and to sweeten the deal, we're going to give away a huge box of color goodies to 5 random color trendsetters that name their color. See, we at COLOURlovers think the smartest and most talented people in the world really do set the color trends... they create the next great designs that shape our creative landscape and they vote with their dollars and purchase the colors they love... So we want their option, YOUR opinion. Name your color of 2010 and win awesome COLOURloving stuff. Name Your Color of 2010. Click Here. 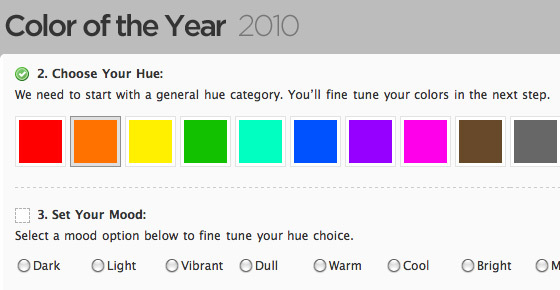 All you need to do is use ColoroftheYear.com - to name & describe your Color of 2010. Your thoughtful entry will get you in the running for one of those 5 goodie boxes... and if you share your color via Facebook or Twitter, you'll double your chances and get a second entry in the drawing. The best professional color software from creative folks. 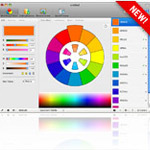 The new ColorSchemer let's you browse palettes on COLOURlovers and a future update will let you start making and publishing palettes to COLOURlovers too. We'll give you two sponsored memberships to COLOURlovers. Use one and give another to a friend. It lasts all year... and we're adding more and more great benefits for sponsors. 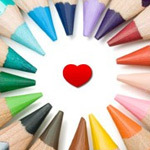 You share the color love all the time... Now you can wear the color love too! 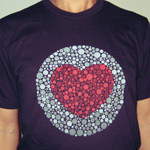 You'll get our logo shirt and our color love blind shirt. Have you made some beautiful patterns with Seamless? Well, why not order that pattern on some fabric from our friends at Spoonflower? 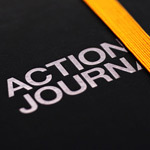 Take notes about all your wonderful ideas with an Action Journal. Moo prints mini cards with a selection of some great palettes from COLOURlovers... but you could also put something else beautiful on your cards... like your face. You decide! Name a Color in 5 Easy Steps. As you complete one step, the next will automatically give you suggestions to help you find your color. Now all you need to do now is name your color. Share it with your friends and post the badge in the comments below too. (Only 1 entry per person will count towards the drawing, but you're free to name more than 1 color of 2010. You have to name your color by September 9th... We'll announced the winners September 10th. As suggested by ycc2106, Highwireart & elibby, in the comments of our last fine set of new seamless patterns, and liddle_r in the forum post August 2010: Fabulous pattern discoveries, here are (only) some of the great recent patterns coming out of Seamless. For some more original patterns follow along and post your own in the forum thread Original Pattern Designs! 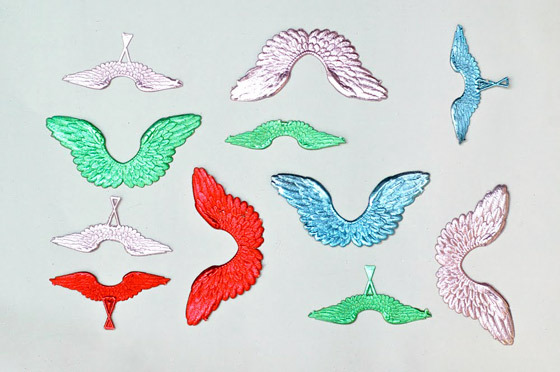 started by ManiacPlz or follow the real-time fun by browsing the most recent patterns to watch for those new designs popping up periodically amongst the always dazzling color variations of the already created patterns. We recently came across the inspiring work of Megan Geckler, and ycc2106's Seamless interpretation of I can tell you how this ends, 2007, it's fantastic, and what's even more fantastic is the group Interpretation Fun focused on that very exercise of interpreting inspiring photos into new patterns. Historically interesting and well designed letterheads collected on Leterheady make up today's color inspiration. Leterheady was started by Shaun Usher, and is an "online homage to offline correspondence; specifically letters. However, at Letterheady they don't care about the letter's content. Just its design." 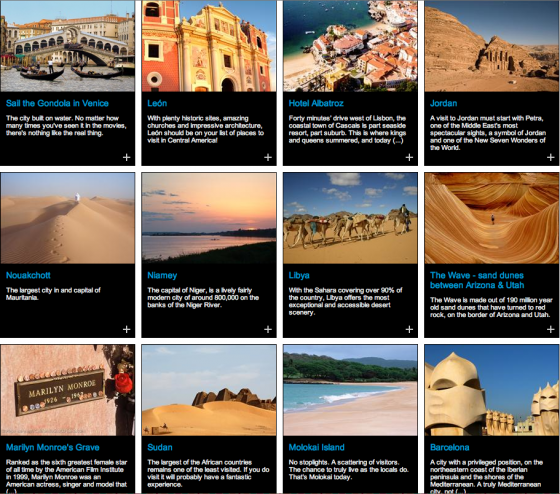 A young company "driven by their passion for travel and software," Explorra is a travel site that offers a range of travel inspiration tools, social features, a full service API for developers, and a Travel by Color tool. 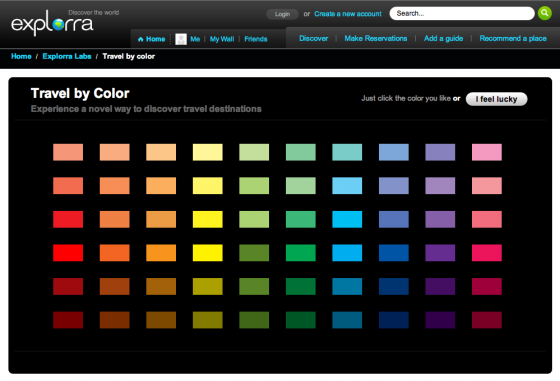 Pick your favorite color, or take your chances with a random selection, and if you need more color inspiration to narrow down the hue for your next holiday check out 1000 (Colorful) Places to see Before you Die or these travel and location inspired COLOURlovers groups: Location Location Location, Travel & Around the World. The Color Strata was created by Weather Sealed. Weather Sealed (whose informative work has been mentioned here once before) is Steven Von Worley who "finds inspiration at the fringes of art, science, photography, and life" and turns it into "quality over quantity, original content, and the occasional chuckle." See it all here. 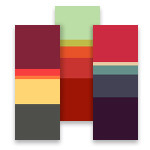 The Color Strata is based on data from XKCD color survey. The self described "incorrigible data hound" Von over at Weather Sealed who like all good hounds for interesting information keeps his nose up for new work by XKCD, another person (Randall Munroe) of the interesting sorts, who has a hilarious archive of "romance, sarcasm, math and language" comics, and a knack for research. Recently XKCD released the findings from his color study. If you're looking for some vintage color inspiration, or a little from the unusual category, check out the progress of Lisa Congdon and her project, A Collection a Day. Today is only day 155 so we still have plenty look forward from the 365 day project. Coming out of Oakland, CA the Scraper Bike kids trick out their bikes in rainbows of color with cardboard, tinfoil, spray paint, and found objects. Two years ago they became a YouTube phenomenon and since then, they've continued to expand, and are still trying to green up Oakland, keep kids in school, and keep them busy with their bikes so they're staying out of trouble. It's such a great grassroots advocacy for safety on the streets. You shall never lack for an interesting backdrop on your computer, thanks to Bobby Solomon of Kitsune Noir. I've long been a fan of Bobby's blog and his Desktop Wallpaper Project is no exception. It completely elevates the idea of a computer background into art, and every week features another awesome illustrator or designer. Bobby's been at this awhile so there is a decent archive of work to pick through as well. Seriously, dude brought in some big guns here. Here's a few of my favorites. 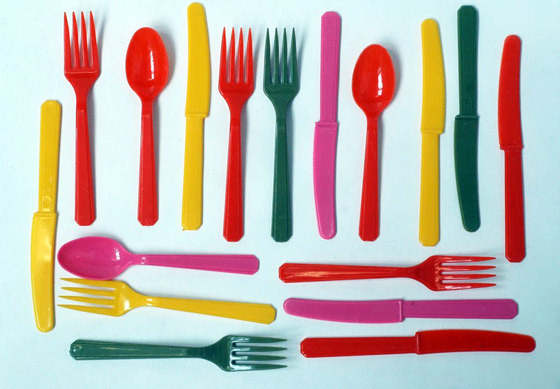 It may not be a new idea, among our chromatically-inclined kind, to conjure up a film-inspired color palette or two. But I especially dig the totally awesome pairing of film still photography + their color palettes. It is the peanuts and the M&Ms (sorry chocolate purists). This totally awesome website, i love hotdogs, is a boon for such stills. And also very handy for updating the netflix queue as well! 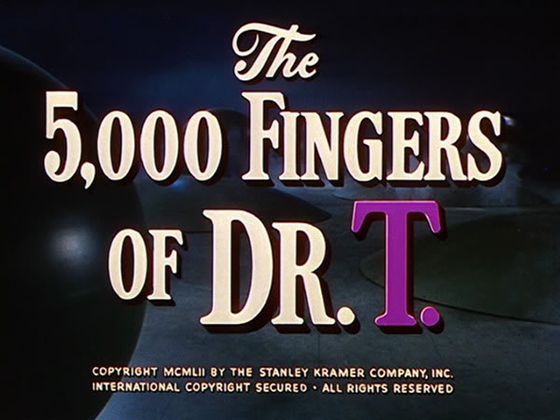 Mostly cult or independent films from 1940s-1990s, there are lots of images from each of the movies. I picked some neat ones from the various eras and threw in a couple of my own. If you're looking for more inspiration or want to share some of your own fav's check out these movie related groups: Moving Pictures, Movie Themed Group, Movies, Stage and Screen, Cinema! & This is my favorite movie!! Seeing more and more interesting typography on the web lately is like a huge breath of fresh air, and thankfully it's an area going through rapid evolvement. I'm so used to the same old typefaces everywhere that even a little bit of departure can make such a stand-out difference. There's several ways to make use of dynamic text replacement (read more about the various ways to do it here) and while I haven't attempted it myself yet, I'm definitely curious if anyone has and what their experience has been. In the meantime, check out some of my favorite sites that use font-integration. 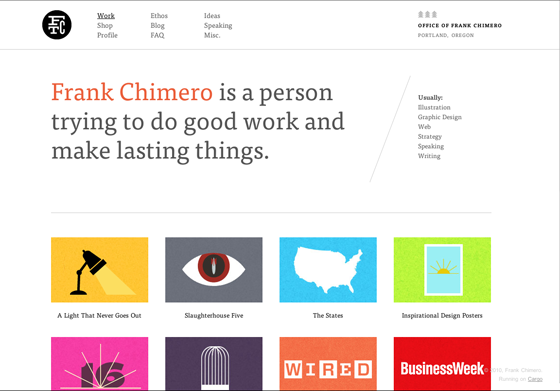 A lot of these came from The Design Cubicle and siteInspire so head over there for even more web design inspiration.